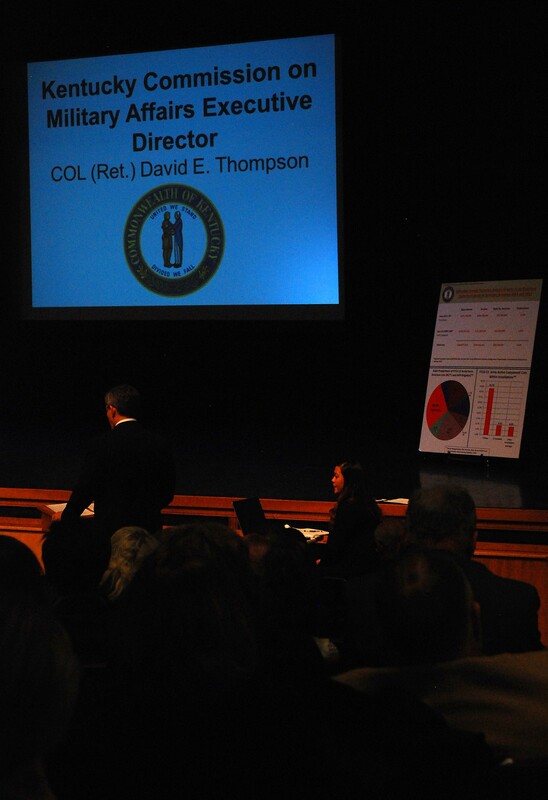 Representatives from local and Kentucky state government as well as local community leaders, educators, business leaders and citizens, gathered at the Hardin County Schools Performing Arts Center in Elizabethtown Jan. 6, before representatives of the Headquarters Department of the Army to layout their concerns for any further reductions and cutbacks at Fort Knox that might occur. Col. T.J. Edwards, Fort Knox garrison commander, facilitated the discussion that included comments from Senators Mitch McConnell and Rand Paul, Congressman Brett Guthrie and University of Louisville President Jim Ramsey. Their comments were directed at Army leadership which is currently formulating a plan to shrink the Army, and thereby possibly eliminate more Soldiers and civilians from the installation. Fort Knox and Cadet Command commanding general, Maj. Gen. Peggy Combs, opened the community listening session by thanking the community, and the region, for the support they continually show to the civilians and Soldiers. She also acknowledged the community's recent efforts of implementing an in-depth letter writing campaign petitioning the Army to leave the post untouched. "In response to the Supplemental Programmatic Environmental Assessment, known as the SPEA, you all wrote 14,135 letters……we finished fourth out of 30 installations," Combs said. The installation, which was famously named for Revolutionary War Gen. Henry Knox, chief of artillery and the first Secretary of War, recently lost the 3,500-Soldier 3rd Brigade Combat Team, 1st Infantry Division, as a result of the president's defense planning guidance of 2012, according to Congressman Brett Guthrie. As the Army conducts community listening sessions at 30 posts that stand to be affected due to the Army's smaller budget, representatives from the Pentagon will visit each area to hear from leaders and citizens who layout reasons why their neighboring post should be left alone. 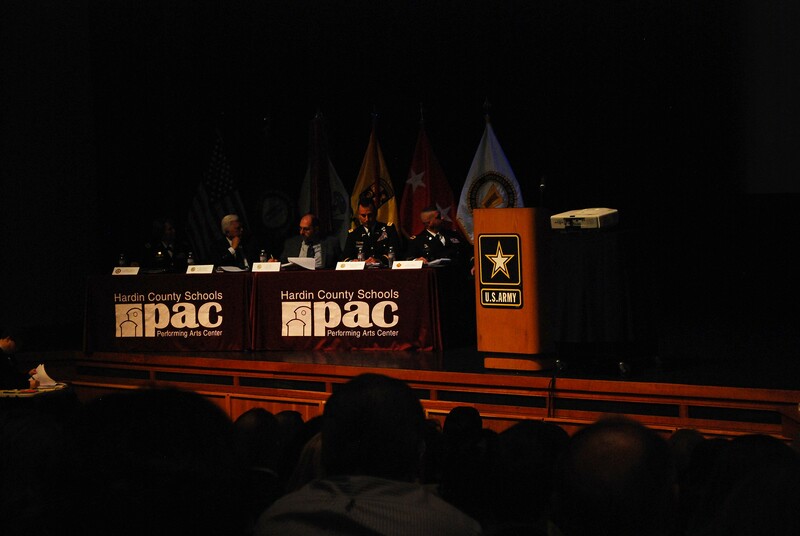 Col. Tom O'Donoghue, who is assigned Army's Force Management Office and was part of the panel visiting from Washington, took an opportunity to explain to the audience, before the presentations, why the Army has to cut its force. O'Donoghue said the Budget Control Act that was enacted in 2012 cut 80,000 Soldiers from the Army ranks--including 11,000 from Europe and another 32,000 who were not assigned to any installation but were used to, "plus up the troops deployed to Afghanistan and Iraq." So very little of those personnel were cut from installations stateside. But the BCA wasn't a single act. He added the second act was "sequestration," which wasn't anticipated in 2013 because it wasn't supposed to be triggered. But it was, and now the Army is required to reduce its costs by another $95 billion, and must reduce its troop strength to 450,000 personnel by the end of fiscal 2017, and reduce by another 30,000 at a later date. Kentucky Gov. 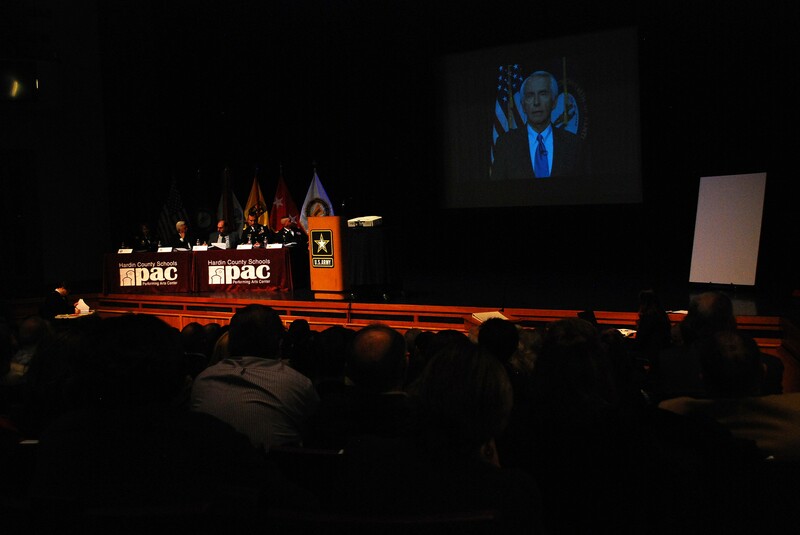 Steve Beshear laid the local situation out in context for everyone to understand, telling the audience of about 600 that even as the Army is required to reduce more personnel, it should be careful how and where it decides to reduce. "We understand the Army is in a difficult position but that they need to measure carefully as they consider the long-term impact of substantial cuts to Army installations," he explained via pre-taped video. "Fort Knox should not be considered for any more cuts but instead be used to host functions the Army has in high cost areas of the country. Using Fort Knox as a point of consolidation for multiple organizations is a smart and sound fiscal decision that will save taxpayer dollars. I encourage the Army to do everything they can to position units and functions in low-cost but highly efficient and capable installations like Fort Knox." Beshear then cited such consolidations that include the recent move of the Army's Recruiting and Retention School to Fort Knox--which aligns it with U.S Army Recruiting Command already located at the post--as positive examples of first steps toward consolidating commands and their functions. Other members of Kentucky's state and local leadership followed Beshear's presentation and added to the facts and ideas he laid out. They pointed out Fort Knox's central location, low cost of living, state-of-the-art facilities, recently improved infrastructure, its more than 87,000 acres of certified maneuver areas, plus the several commands that now reside on Fort Knox. They added it would be financially responsible to continue to use the already built and renovated facilities and grounds--much of which was done in response to the 2005 BRAC. Ramsey pointed out his school has partnered with the post since 2011 via a memorandum of understanding, and the outcome is one he doesn't think exists elsewhere between an installation and, "a premier metropolitan research university." "We recognized some time ago that Fort Knox was not just an economic driver force for Hardin, Meade and Bullitt counties. We saw the brain power and leadership skills of the Soldiers and families at Fort Knox as a key to the economy of our region and state," Ramsey explained. "(UofL is a) research university that can provide training and a college education to Soldiers as well as research in areas like PTSD and combat injuries." Ramsey said the memorandum of understanding details 10 areas of cooperation and expansion, which include TBI and PTSD, fitness programs, financial counseling, expansion of leadership and training programs in the fields of human resources, engineering and business and participation in sustainability initiatives to reduce energy use and cost. Some of items the school has received in exchange include physical training and team building exercises for the school's student athletes and opportunities at medical research with wounded warriors. Other points brought before the panel included the installations energy efficient factor. The post has spent significant time and resources over the last ten years investing in a solar power window field, thermal energy taps for all new construction and retrofitting existing buildings, harvesting its own gas wells, and spring generated water. All these innovations save the Army millions of dollars a year. 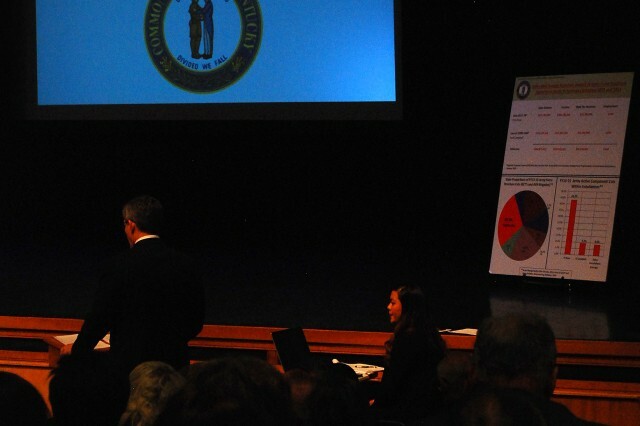 Once the 15 prescheduled local and state leaders were given a chance to present facts for leaving Fort Knox alone during this next round of cuts, audience members were given the chance to speak to the panel. Those observations presented included a suggestion to bring a Stryker brigade to the post; a plea to ensure the proper environ-mental information is considered regarding poor, disadvantaged local community impacts; and a recommendation that with all the money the state and local government put up, and the money the U.S. government spent in preparation for 2005 BRAC to upgrade the area infrastructure and upgrade the post, the Army should consider moving units out of costly areas and relocating them to Fort Knox. In the end, all the presenters--prescheduled and audience members alike--had the same message for the panel as Ramsey gave as he closed. "UofL stands ready to advocate, support and help in any way we can." * Fort Knox near "Top 25" of all U.S. cities for number of Energy Star rated facilities. * Elizabethtown, Kentucky Metro Area ranked first by DOE as Top Energy Star Small City in 2014 with 53 certified buildings. * 50 of those buildings are located on Fort Knox. * Annual Cost Savings of $ 1,950,100. * Due in part to solar panel field and geothermal program.